I WENT ON the wagon in 1996, but I once was a drinking man. Not a falling-down drunk, but a constant imbiber. Every day. Without fail. For 25 years. Not recommended. It affects relationships. No matter. Some bars I have loved. 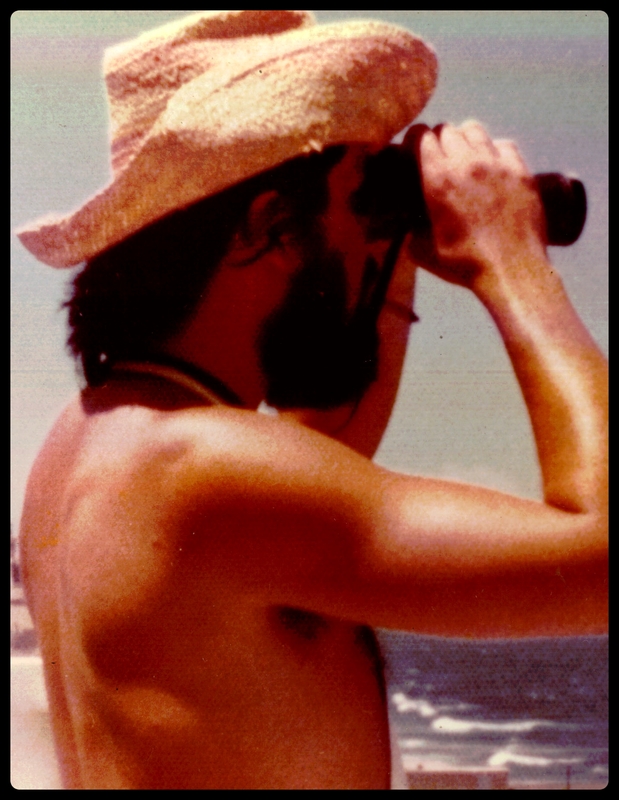 In a recent post, I mentioned that a bartender who served me in the 1970s in New Orleans is a part-time resident here on my mountaintop. It was one of the bars I loved. The Abbey. 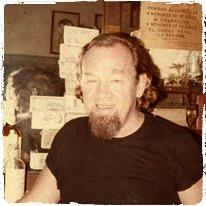 My most beloved bar of all — El Batey — was in Old San Juan, Puerto Rico. Recently I did an internet search, wondering if El Batey still existed, and it surely does. 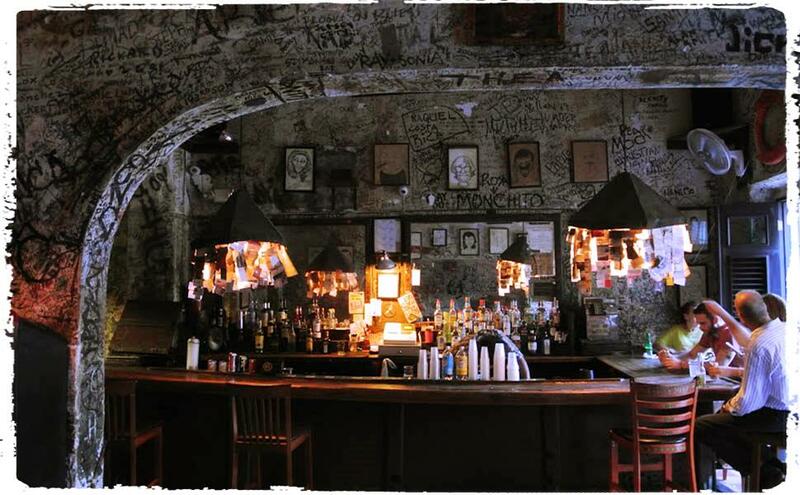 It’s now the oldest bar in Old San Juan, and it has its own Facebook page. But what business doesn’t? El Batey has changed a lot over the years, but outside more than inside where the only alternations seem to be more wall graffiti. Here is a current exterior shot, just below, and a photo from when I drank there, farther below. Note the street surface in the photo to the left. It’s blue stone that Spaniards brought to the New World as ballast in sailing ships. 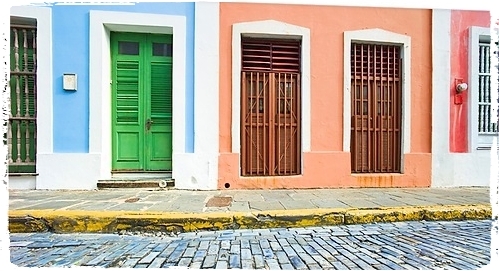 It was recycled into cobblestones in what is now Old San Juan, which is San Juan’s version of New Orleans’ French Quarter. You don’t encounter blue streets very often, and they take on a particularly lovely cast when slicked with raindrops. When I moved to San Juan the first time in the early 1970s — I was there twice, once for five months and a second stint of 11 months — I had a black BSA motorcycle shipped down from New Orleans in the hold of a Sealand freighter. 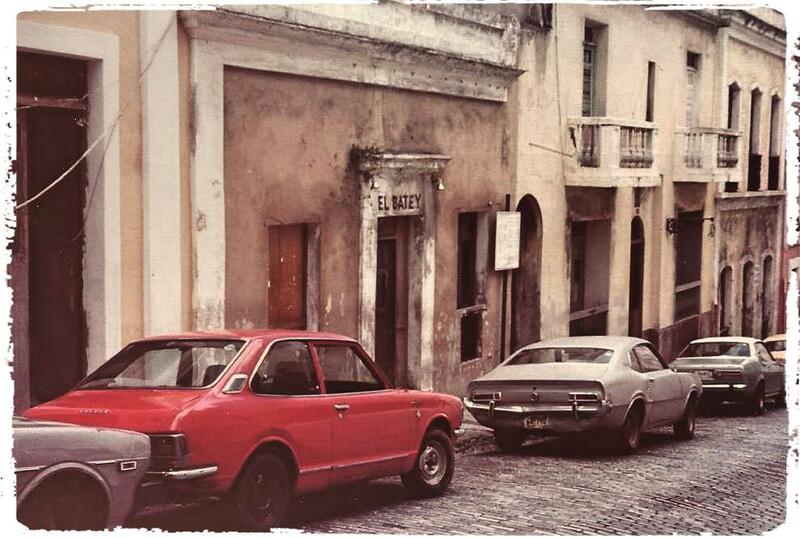 A decade ago I wrote El Morro Sunrise about a late night in El Batey while the black BSA leaned on the cobblestones. My two spells in San Juan were separated only by a year or so. When I returned for the final time I brought a record from New Orleans. It was one of Jimmy Buffett’s lesser-known ditties, titled Why Don’t We Get Drunk and Screw? The owner put it on the jukebox. El Batey was owned by Davey Jones. 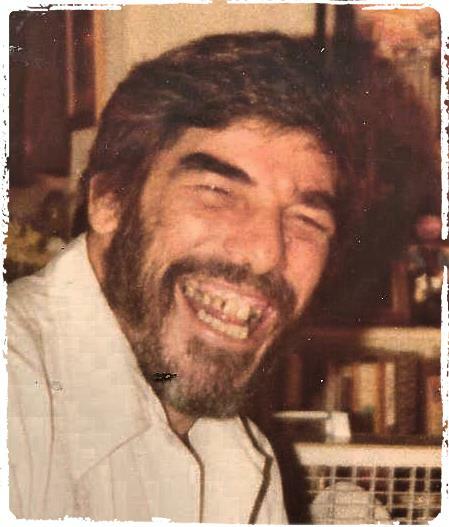 In the early years, while I was there, he had a business partner named Norman, a spectacularly delightful man. My second ex-wife and I visited Puerto Rico in the early 1990s, about 20 years after I lived there, and the only time I’ve returned. We went to El Batey, and Jones told me that Norman had died. Far too young. If memory serves, Davey was one of those mail-order ministers with the legal right to perform marriages. I was smitten at the time with an Argentine floozy who’d overstayed her visa. I decided to marry her so she could stay in San Juan, and Davey agreed to perform the ceremony. But it never happened, thank God. Which is why you shouldn’t drink, boys and girls. During that 1990s visit, I checked the jukebox for my Jimmy Buffett record, but it was not there. One of Davey’s daughters, Maria, told me on Facebook that he died last year. He was in his early 80s. R.I.P. Both fore and aft of my times in San Juan, I favored a bar on Decatur Street in the French Quarter of New Orleans, a city where I lived off and on — mostly on — for 18 years. For a time after my first divorce, my ex-wife tended bar there, and it’s where she met her second husband, the guy who jumped bond on a marijuana charge and hightailed it to Canada with my ex-wife and my daughter. The Mounties nabbed them three years later, and they were returned to New Orleans where everything eventually got straightened out, and both ex-wife, second husband and daughter are now upstanding citizens. 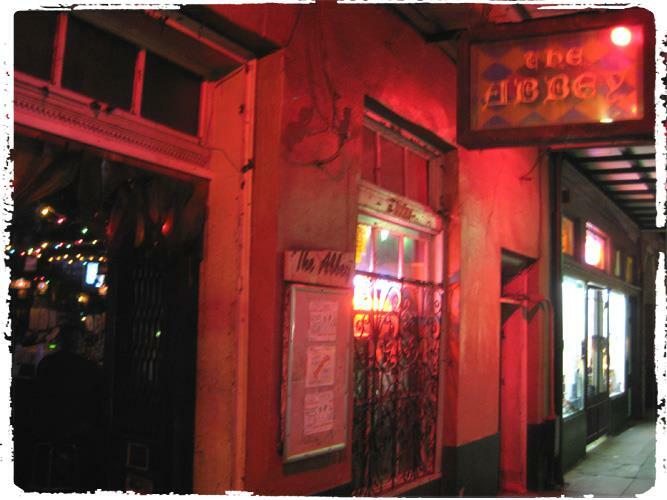 The Abbey is one of a handful of New Orleans bars that never close, a characteristic that suited me wonderfully. On Sundays, back when I was a patron, the owner laid out a spectacular free spread of snacks that negated your having to buy your own main meal that day. 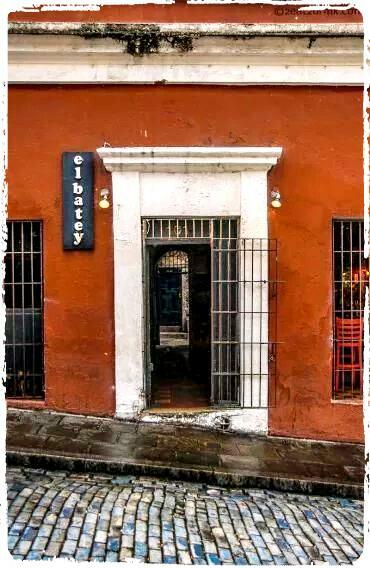 Between the two, I favored El Batey, but I’ve spent far more nights in The Abbey. If you stumble out of The Abbey at dawn, lurch right a couple of blocks to Jackson Square, look left and you’ll see the levee that holds back the Mighty Mississippi. You’ll spot freighters passing above the levee’s crest because the river is higher than the city. It’s like watching ships sailing in the sky.